*also depends on dictionary, if we use dictionary-based approach for word boundary detection. Safari 3.1.2 on Mac OS X has no problem on this test case, both keyboard and mouse selection. Prabhat, are you still working on this? Can someone test this case with Firefox 4, and confirm the problem still exists? Firefox 4.0b8pre on Ubuntu 10.10 has problem on this case. I use Firefox 4 beta on Window 7. 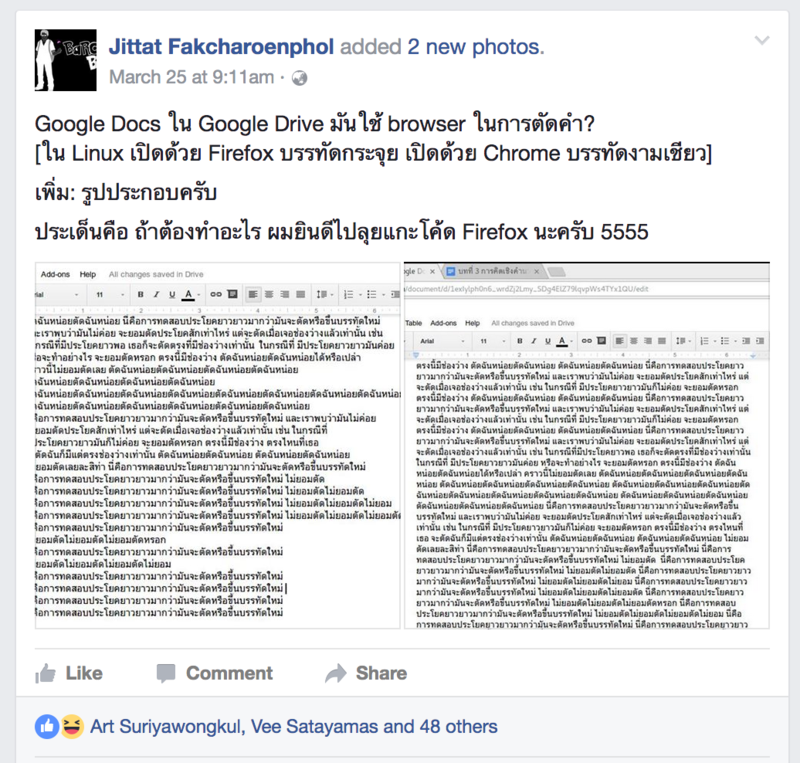 The people here at Barcamp Bangkok are saying this bug is a major problem in daily-usage of Firefox. Enhancement -> Major. David or Masayuki, do you know where in the codebase we'd need to change in order to fix this? A contributor has a Thai word-boundary detection algorithm he's implemented in Java, and is interested in converting it to something we can use. In the code in intl/lwbrk/src/, there is integration with platform-specific line-breaking code for line breaking in certain languagse. See the ifdefs in the Makefile.in in that directory that choose an appropriate platform implementation of NS_GetComplexLineBreaks. However, it sounds like this bug isn't really about line breaking, but rather about selection movement and extension; I think the relevant codepath may be that code in nsSelection.cpp calls nsIFrame::PeekOffset which in turn calls nsTextFrame::PeekOffsetWord. Arthit said earlier today that libthai has code for word boundary detection, but that we're not using it. Maybe the solution is to have the relevant selection code use libthai instead of whatever it's using now? roc may have some more advice. Cc'ing Theppitak, who wrote the linebreaking code for Thai. Perhaps he knows the best way forward here, or would be willing to write a patch for this? no significant difference between line break and word break for Thai. This first patch uses NextWord() instead of BreakInBetween(), and only patch the NextWord() method, not the others. Just for further discussion. Masayuki, are you the right person to take a look at Theppitak's approach in this patch? I'm not so familiar around the complex script part. However, if nobody will review it, I'll try. Please create diff files with |-U 8 -p|. That makes patches easy to review. Anyway, thank you for your work. # And sorry for the delay to reply due to my vacation and Japanese vacation season. I've reformatted the patch as Masayuki suggested. Please review it. Thanks. Roc or smontague is better reviewer. If they are too busy, I'll try, though. then pass breakBefore.Elements(). The implicit destructor will clean up for you. You could make it an nsAutoTArray to avoid some heap allocations. This still isn't a very good interface. It's quadratic in the number of words in the text. Seems to me we need a new method in nsIWordBreaker that does exactly what the loop in nsTextFrame does: fills in a word-breaks array for the entire string. Which, conveniently, is what NS_GetComplexLineBreaks does. Can you do that? If not, needinfo me and I'll try to find someone else to help. This patch uses nsTArray as roc suggested. It looks cleaner now. > string. Which, conveniently, is what NS_GetComplexLineBreaks does. - Add a new method GetWordBreaks() to nsIWordBreaker (with uuid regenerated). - Add the method in nsSampleWordBreaker and implement it. - Modify the ClusterIterator c-tor to call the new method instead. This patch now adds the new nsIWordBreaker::GetWordBreaks() method, implements it in nsSampleWordBreaker, and modifies ClusterIterator to use it. Document that some elements of aBreakBefore are set to true and the rest are untouched. Edited patch according to roc's comments. Thep, could you please take a look? > Thep, could you please take a look? Oh, I've ignored textStart value in ClusterItarator c-tor in the latest patch. Fixing soon. - The incorrect filling of word breaks without textStart concerned, which could cause wrong behavior when aDirection < 0.
test_bug496275.html now passes in my box. I'm not sure about others. I was wrong when saying that test_bug496275.html was passed in my box. I just forgot how to really run mochitest when saying so. - does not assign aBreakBefore[aLen] by guarding the curEnd index. OK. It must have worked by chance due to my debugging process. So I've adjusted the amount of calculated data as such. (The guard against aBreakBefore[aLen] writing in the last patch is also reverted.) It should really pass the mochitest now. if that all comes back clean, you'll want to upload a new patch with hg metadata (incl your name, email, commit msg) as seen per https://developer.mozilla.org/en-US/docs/Creating_a_patch_that_can_be_checked_in and re-request roc for review again (for sure). Patch formatted for review & commit. Please review again. Thanks. > +   * Note that aBreakBefore is assumed to be initially filled with false. > +   * Only word break positions are set to true, and the rest are untouched. Since aBreakBefore[aLen] is always set to true, I think it would be simpler to say that aBreakBefore has aLen elements. Then in   ClusterIterator::ClusterIterator set mWordBreaks[textStart + textLen] to true. Updated patch after roc's review. > > +   * Note that aBreakBefore is assumed to be initially filled with false. > > +   * Only word break positions are set to true, and the rest are untouched. OK, done. But I think it should be mWordBreaks[textLen] instead. Done in all the four commented places, plus another one in BreakInBetween(). From _tests: Kept 20139 existing; Added/updated 0; Removed 0 files and 0 directories. No tests could be found in the path specified. Please specify a path that is a test file or is a directory containing tests. i.e. you should provide the path to the test file in the source tree. > i.e. you should provide the path to the test file in the source tree. I did that, too, with no success. Note that I succesfully ran test_bug496275.html in the previous round. But the same method does not apply to the last two tests. Oh, these aren't "plain" mochitests... for test_eventemitter_basic.html, you'd need to run mochitest-chrome, and for test_virtualcursor_text.html, it'd be mochitest-a11y. OK. I can run the mochitests successfully now. Thanks for your advice. Unlike what's seen on tbpl, test_eventemitter_basic.html passes. But test_virtualcursor_text.html fails alike. I'll check the latter, then. Not related to the a11y mochitest failures, this patch fixes another problem I have found myself: word-wise backword movements in previous patches occasionally move too far. This was because ClusterIterator::NextCluster() sometimes moved past word break position without returning. I have also added a mochitest for this bug. Note that the test will be failed if the change to ClusterIterator::NextCluster() is not applied. I'd like to get the additional change reviewed before working further on the a11y mochitest failures. Having thought on it more thoroughly, now I think I have done it more correctly. GetWordBreaks() calculates word break positions on the total aContext string of length aContext.Length() (no additional slot at the end). Then, we copy the resulting word break positions from textStart to textStart+textLen, i.e. of length textLen+1, into mWordBreaks. Note that even though GetWordBreaks() only calculates at most aContext.Length() positions, we need to allocate aContext.Length()+1 slots for breakBefore array, so we can still safely copy textLen+1 slots when the text of interest is at the end of aContext. The default false value as initialized is in accordance to what the old code using BreakInBetween() did. That's how it should really work. The previous guesses with true values on position 0 and textLen+1 were based on special cases, which don't always apply in general. OK. In ClusterIterator c-tor, mWordBreaks or mWordBreaks[textLen] may be initialized with true, and using PodCopy will overwrite it. To behave exactly the same as previous code, we need to OR the word break positions instead of assigning them. This passes the two failed mochitests. I can't run the os-x mochitest, though. I'm using Linux. Please review it again. Thanks. I've been busy preparing for a conference right now. I'll be back to work on it soon after that. I confirmed today with some Mozillians in Bangkok that this bug still exists. Do you have the time to update the patch to contemporary mozilla-central and trying again? My machine that was used to build mozilla has been out of order. And I'm currently engaged with some job right now. So, I'm afraid I can't work on it yet. Meanwhile, I'm happy if somebody could finish it. How about we give Theppitak level one access so he can build and run tests on the mozilla infrastructure? Theppitak, if you happy to finish this please follow https://www.mozilla.org/en-US/about/governance/policies/commit/. Would this patch fix the issue shown here, where Google Docs is breaking at the wrong place? Or is that a different bug? > Or is that a different bug? I got pinged on this bug by the thai community on our l10n workshop, and I've spent a few to see if I can get the patch to apply and build. The answer is yes, so I've uploaded the result to review-board and pushed to try. I know from local testing that the actual test in this patch fails now, but probably because we restructured stuff in test infra. From testing at the event, the double-click selection works for thai, it doesn't work for lao, though. I wonder if three years later, with icu in our code, we can actually implement this in a way that works for all lanuages with this problem? Note, I won't be able to actually do anything useful beyond C++ nits, but this should give folks a head start. > implement this in a way that works for all lanuages with this problem? That should be easily fixable, e.g. by casting the bool to a uint8_t. > > implement this in a way that works for all lanuages with this problem? > jfkthame, would you know? Well.... ICU has line- and word-breaking support, though currently I believe we exclude that from our build. So enabling it would increase our code (and data) size, as it'll pull in the Thai dictionary that is used to identify word boundaries. I'm not sure what the total size impact would be, but given that we're still waiting to shoehorn ICU into the Android build, I'd be hesitant to do it right now. If we do (eventually) move to an ICU-backed solution, that should work for whatever languages ICU supports -- I think that includes several of the SEAsian languages that have similar issues. The same would be true, though, for a solution based on platform-native breaking (like we currently use for line-break): although the patch here specifically checks for Thai letters, it could perfectly well do the same for Lao, Khmer, Burmese, etc., and pass those through to the platform breaker as well; then we'd get support for whatever languages the host platform implements. Eventually, a re-write of both line- and word-breaking to use ICU services consistently across all platforms (and eliminate platform-specific code here) would probably be a good thing. But until we tackle that, something along the lines of the patch here is probably the easiest interim solution.